Access the Clopay® nationwide network of expert dealers for assistance in making the right selection. When the time comes for installation, our authorized dealers show up on time and work with precision and attention to detail. Once finished, they’ll clean up the workspace, meaning you’ll only enjoy the beauty of your new glass and aluminum garage door. 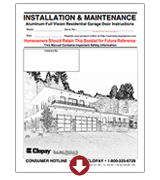 To many homeowners, glass seems like an unconventional choice for a garage door material. Many are not even aware it’s an option. However, garage doors made of glass offer several benefits, including affordability, versatility, strength and curb appeal. This guide explains the many ways a glass garage door could be a valuable investment for your home. One of the most obvious benefits of glass is its ability to light up your interior space. Glass garage doors can turn your dark storage area into a warm, inviting living space that you’ll want to use more often. While light can be let in in other ways, such as by replacing several panels with windows, the amount of light this can provide is limited. A garage door made completely out of glass, on the other hand, will let in significantly more light, so you won’t have to rely on artificial light to complete your tasks. It boosts your vitamin D. When skin is exposed to sunlight, it produces vitamin D, an essential nutrient that reduces your chances of heart disease, bone loss, weight gain and a variety of cancers. It keeps seasonal depression at bay. Increased exposure to natural light can ward off seasonal affective disorder (SAD), an illness that affects 6 percent of Americans, as well as “winter blues,” a less severe but still debilitating disorder that affects another 14 percent of the population. It improves your sleep. As mental health is often closely related to sleep, it should come as no surprise that natural light can affect both. A study has shown that workers who received more natural light slept better. It reduces health issues associated with fluorescent lighting. The more time you spend around natural light sources, the less you’ll need to spend under unnatural light such as fluorescent bulbs. Although generally regarded as safe, fluorescent light has been known to elicit an elevated level of stress in some people. If fluorescent lights are your primary source of light all day long every day, the risk of migraines and strained eyes may increase. Even if you’re only in your garage several minutes every day, these short exposure periods can improve your health and the way you feel. Humans spend the vast majority of their lives inside, so being exposed to natural light as much as possible while indoors is essential. If you own a business, give some thought to a glass garage door in your working space. This may improve the health, mood and productivity of your workers. If your home is surrounded by gorgeous nature, beautiful landscapes or charming houses, why block the view of these things with a traditional door? Glass garage doors let you admire this beauty from inside while still protecting you as well as a conventional solid door would. Glass doors also make your interior space feel more spacious. When lit up from the glow of natural light, the potential uses for your garage increase dramatically. You could put in a workshop, gym, greenhouse or practically anything you’d like. Also, if you’ve been considering adding an extra room to your home, you could convert your garage into the desired room instead and save lots of time and money in the process. A glass garage door will also reduce your electric bills, as you won’t have to use artificial light sources to brighten up your space. And despite the common misconception, doors made of glass are not necessarily bad insulators. 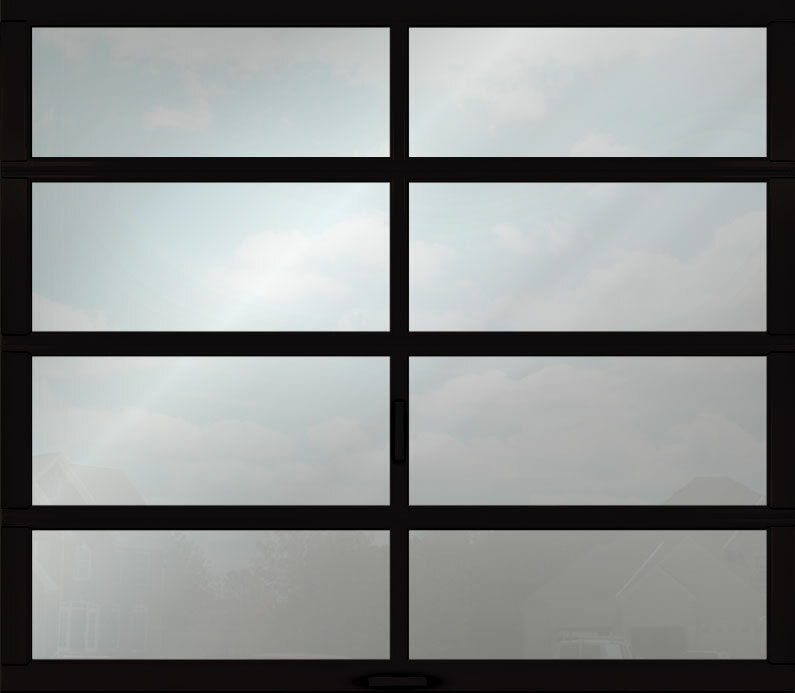 Glass garage door models often feature glass panels with insulation, making your home more energy-efficient by not allowing the hot air inside in the summer and not letting it outside in the winter. If you’re planning on selling your house down the road, a glass garage door will likely increase the attractiveness of your home. After the roof, a garage door is the second largest part of the exterior of homes, so a modern and trendy door can make your property much more attractive to buyers. As you may have guessed, increasing the curb appeal of your home often leads to an increase in its value. According to a report in 2016, garage doors were among the five best investments for increasing the resale value of your home, giving homeowners a 91.5 percent return on their investment. If that door is glass, you could expect a return that’s even higher. Unlike wood doors, no extra coatings are required for glass doors, which means much less maintenance. 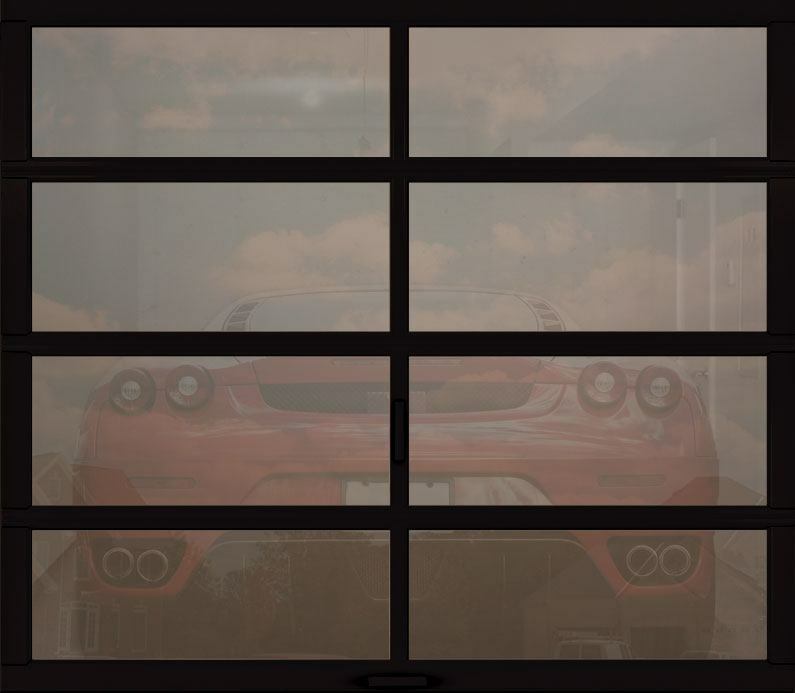 Because glass doors contain aluminum, you’ll never have to deal with rust, corrosion and other problems that come with having a traditional garage door. The only maintenance required of glass doors is cleaning the glass panels every now and then, which you can do with a regular glass cleaner. If you’ve been in a lot of new houses recently, you may have noticed a new trend — glass garage doors aren’t just used for garages. They can be found in many other parts of homes, where they are used as an “opening wall.” In dining and entertainment rooms, they provide beautiful views of the backyard and, if opened up, let you access recreational areas outside. As mentioned earlier, these doors help your interior appear more spacious, which can be useful for smaller rooms. This is also a lost-cost makeover, as it doesn’t require the flooring to be changed at all. It allows companies to display their best products, thereby attracting more passers-by. It allows them to promote themselves better, as they can display banners and signs advertising bargains and sales. It provides more natural light inside, which most employees and customers prefer to artificial light. As glass garage doors don’t suffer from rust or corrosion, they won’t make your business appear less professional — as long as you still clean them, of course. They’ll help your business stand out. If you’re a restaurant owner, you can keep the doors open to let your customers dine in sunlight and fresh air. If it gets cold or starts to rain, you can just close them. Glass doors are highly customizable, and you can pick any style, color or finish that you’d like. For example, you could choose a style with white aluminum and nontransparent glass panels, or go with a more rustic and darker style that features grays and blacks. More colorful and distinctive options are also available. The wide variety of customization options allows you to easily match your glass garage door with style of your home’s exterior. 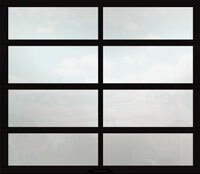 Of course, the number of customization options for glass garage doors will depend on the manufacturer. We believe that the widest selection of premium doors is the Clopay® AVANTE® collection. The doors from this collection, all of which are made of aluminum frames and glass panels, are sleek and modern. There also many transparency options available to suit your privacy and lighting needs. 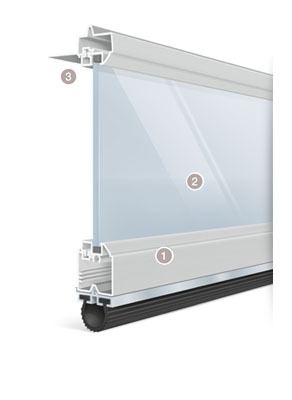 You can even choose insulated glass to increase the energy efficiency of your home. Doors in this collection are protected by a warranty of three years for the hardware and five years for the finish. They also feature a reinforcing pin, which gives the door added strength and longevity, and ball bearing rollers made of heavy-duty steel, which allows the door to operate quietly. Many assume that, because these doors are made of glass, they must be fragile. However, because of their strong aluminum frame, they are rather durable — often more than their traditional wood and metal counterparts. Glass garage doors also feature a pin that reinforces them. Aluminum is particularly dent-resistant — much more so than various other door materials. This is important, as garages often contain many items that may fall over and impact the door. 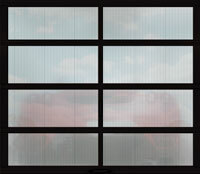 The garage doors’ aluminum frames can also easily endure harsh weather conditions. They are not easily affected by strong winds, they don’t rust and they’re completely unaffected by temperature changes. As garage doors are regularly exposed to high and low temperatures, rainfall and humidity, this is also an important point. If your home is near the coast in Texas, Florida, the Carolinas or other hurricane-prone areas, you may have concerns about whether these doors can stand up against hurricanes and the extremely strong winds that they produce. Clopay’s Avante collection features products that are Windcode®-rated, which means they were designed to resist certain maximum wind speeds. To figure out the Windcode rating needed for your home, you can follow the instructions on Clopay’s website, which is dependent on where you live, your home’s structure and other factors. Then, when it comes time to shop for your door, don’t forget to purchase one that has the required rating. If you’re in a hurricane-prone area and have a door that isn’t wind-rated, it can lead to a catastrophe. Strong winds can pull it out, which will, in turn, cause the air pressure in your home to increase. This will ultimately cause your roof and walls to blow out. These doors don’t just protect you against undesired weather — they also keep out unwanted people. Many glass door models feature panels with tempered glass, the same type that is used in cars. Tempered glass has four times the strength of regular glass, meaning that it can withstand a maximum of 24,000 psi of pressure. And on the rare occasion that it does get broken, it will not shatter into countless small pieces, meaning anyone there during the incident has a much lower chance of getting injured. Another concern you may have about glass doors is that you’ll feel like passers-by can easily peer in. Or you may be afraid that a see-through door will allow burglars to see your valuable belongings. Once again, you don’t have to worry — Clopay offers a wide variety of glass products, including tinted and frosted, which will obscure the interior of your garage while still letting in light. If you would like complete privacy, you can get mirrored glass, which completely reflects the outside world. There is one more advantage to glass doors that is not often discussed — when exiting your garage in your vehicle, a transparent door allows you to see if anyone is on the other side before you open it. If young ones are running around outside, this point is particularly important. Statistics show that every week in the United States, over 50 children are run over by cars backing up. In these situations, it is often the case that a parent was coming out of the garage. 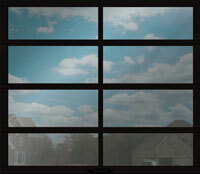 If your neighborhood has a relatively low rate of burglaries, it may be best to opt for transparent garage doors. If you live in Houston and are looking for the ideal glass garage door, Halo Overhead Doors is the dealer you want. With over 25 years of experience, we are the most experienced garage door dealer in town — and the glass garage doors that we sell are the best of their kind on the market. At Halo Doors, customer satisfaction is our highest priority. That’s why we do all we can to make sure you’re happy with your product and service, and we offer benefits like the Gold Bar Warranty, a generous warranty that will protect your investment until you sell your house. We also provide zero-percent financing and match all written quotes. To request an estimate for an Avante glass garage door, fill out our online form or call us at 713-224-3667. We’d be happy to help you choose a door based on your budget and needs or answer any questions you might have about our products or services.